Following the “Mask of Mayhem” teaser, Gearbox Software has revealed the first full trailer for Borderlands 3. The nearly four minute long trailer gets right to the point, thrusting Borderlands fans back into the world of Pandora, where they will once again take control of a Vault Hunter chasing the dream of murder, mayhem and lots (and lots) of loot. The trailer shows off some of the Borderlands series’ trademark chaos alongside some of the new characters players will be able to meet and take control of, the vast new areas they will be able to explore, and a few familiar faces and locations thrown into the mix as well. 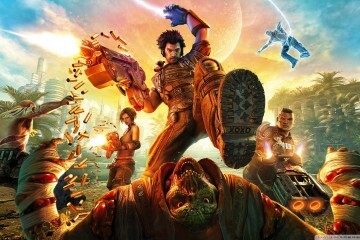 Additionally, Gearbox is seemingly teasing multiple “worlds” to explore and save, not to mention over a “billion” guns, which sounds about right for this franchise. The trailer does not give an official release date for Borderlands 3. However, the YouTube description explains that more information on the game will be released on Borderlands.com on April 3. Of course, Borderlands 3 will be the the third mainline game in the Borderlands series and the fifth overall, following 2009’s Borderlands, 2012’s Borderlands 2, 2014’s Borderlands: The Pre-Sequel and the 2014-2015 Telltale series Tales from the Borderlands.